For anyone who remembers The Bee Movie, the 2007 DreamWorks animation film featuring the voices of Jerry Seinfeld and Renee Zellweger, you’d be excused for thinking that Honey Buziness is related. While some of the characters in Honey Buziness do share a striking similarity to some of The Bee Movie animations, there is absolutely no link between the film and this new Microgaming/Bluberi pokies release, other than the fact that they’re both a little sassy and damn adorable. This new bee themed video slot provides a light hearted contrast to some of the darker, more serious recent releases like Dracula and Tower Quest and will be a nice alternative for players who like their pokies fun and vibrant. Unfortunately as of 2017, it appears Honey Buziness is no longer available to play at our top-rated online casinos. We can’t be sure why this game is no longer on offer, but if you’re looking for the largest selection of online slot games, we recommend paying a visit to Slots Million where you’ll get instant access to 1800+ of the best pokies on the Web. Slots Million offers a range of secure deposit options and is protected by the highest in digital SSL security encryptions. Honey Buziness is set inside a beehive and follows a bunch of worker bees and the Queen Bee as they go about their daily business conjuring up sweet, sweet nectar. Along with the busy bees there is also a cheeky bear character who’s hungry to get his paws on their hard earned honey. The game uses cute animation and a fun, cartoon style design to provide a fairly basic pokies game but with some exciting bonus features that help boost its appeal significantly. The game is played over five reels with 30 pay lines. There’s a minimum bet of 30 cents and a maximum bet of $30.00, with the total jackpot set at 30,000 credits. Symbols consist of bee characters, the bear, a honeypot, the Honey Buziness logo, free spins, a bonus symbol and Jack, Queen, King and Ace. Wild symbol – the bear character is the games wild. The wild substitutes all symbols except for the scatters and the games ‘bonus’ symbol. Scatter symbols – there are three scatter symbols in Honey Buziness including the ‘spins’ honeycomb symbol, the ‘bee spins’ symbol and the ‘free spins’ symbol. The scatters can only appear on reels two, three and four and can’t be substituted by the wild symbol. There are no payout for scatter wins, they simply trigger the bonus features explained below. Honeycomb Bonus – choosing to play this bonus round brings up a grid of honeycomb symbols. Players select four pieces of honeycomb by clicking on the symbol to reveal the value that lies underneath. At the end of the round you’re awarded the total amount you managed to reveal, giving you the chance to win up to 50X your original bet. The bee symbol may also appear at any time during the honeycomb bonus to grant you anywhere from two and five additional bonuses. 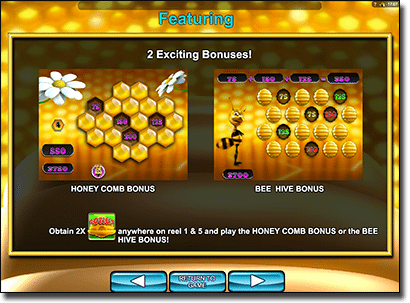 Beehive Bonus – choosing this bonus game will reveal a screen full of inconspicuous beehive symbols. Working in similar vein to an Internet scratch card, the player is required to find three matching pairs of values hidden underneath the hives in order to win the full value. The funny little bee character hanging out on the side of the screen also has the power to randomly award a two or three times multiplier onto any of the matching amounts you have uncovered. During the beehive bonus there is the chance to win up to 110X times your original bet. Free Spins – landing two ‘spin’ symbols on reels two and four along with one ‘free spins’ symbol on reel three will trigger the free spins bonus, awarding you seven free spins. Free spins can be re-triggered during this bonus round. Bee Spins – landing two ‘spin’ symbols on reels two and four along with one ‘bee spins’ symbol on reel three will activate the bee spins bonus for a total of five spins. During this feature the reels change entirely to be made up of only the bee symbol and the Queen Bee symbol. The payout you receive from this bonus round is based on how many of each of these symbols appears, with the Queen Bee symbol awarding a two x multiplier on your total win of that spin. While there’s nothing extraordinary about the base game, the bonus features in Honey Buziness definitely add some huge appeal. Not only do the bonus rounds add the potential to significantly boost your winnings, the interactive nature of them is a lot of fun to play. Granted that during our testing the alluring beehive bonus and honeycomb bonus were pretty difficult to trigger, it was totally worth the wait once they were activated. Plus, we’re always a sucker for a good, cartoony video pokies game that doesn’t take itself too seriously. 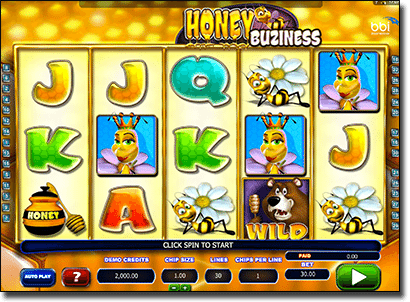 Punters who enjoy their pokies light hearted and colourful will definitely get a buzz out of Honey Buziness. For a large selection of online pokies, we recommend checking out Raging Bull Casino, our top-rated casino site for players from United States, which has some excellent welcome bonuses available for new players.